Sixth form and further education college on South End. 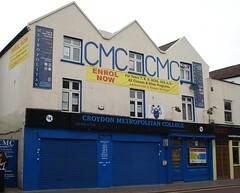 Previously known as Croydon Tutorial College. Specialises in business, IT, tourism, and hospitality. The premises were not always used as a single building. In the past (certainly as of December 2006), number 28 was occupied by a South African Indian restaurant called 1860; we're not sure what numbers 30 and 32 were at this point. Last edited 2019-03-26 14:37:52 (version 24; diff). List all versions. Page last edited 2019-03-26 14:37:52 (version 24).